Twistin Smore, is a stunning dark Liver Chestnut. She has had 2 foal and the oldest is a yearling. She sells with a stud colt on her side and a baby in the belly. Both foals by Smoke N Black Hawk, Black Overo (double blk gened), he is a 6 X World/Resv. World Champion. Reining, Working Cow Horse, Calf Roping and heeling. He is just as nice in the Heading and Steer Stopping, winning prelims at the world show under all 10 Judges in both, to bad his rider figure eighted the finals in both. He was also World Show top cattle horse and Resv all around world show. He was a bad cat in his day. Twister will load, tie and trim just fine. She is easy to bred also. Super heavy built with nice bone for a Cutting bloodlines. She is strait legged. She foals on her own and is an easy keeper. 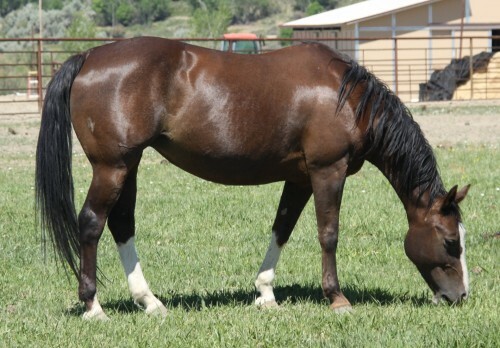 Her colt is a flashy Bay Overo and a leggy colt, 4 high white sock, big blaze, Big spot of white under the belly and 1 Blue Eye.